Home » Weekly Wine Reviews » Sauvignon Blanc – Mrrow! A little cat pee can be a good thing. I’m talking about Sauvignon Blanc here, people – bear with me! Personally, I like a little touch ‘o litter box when I sniff a Sauvignon Blanc. More politically correct wine judges would call that aroma “boxwood,” but I am The Wine Wench, so what do you expect? Mrrow! Along with cat pee, aromas of grass, hay, grapefruit, melon and green herbs are often present in Sauvignon Blanc. These aromas are often present as flavors as well (not that I’ve actually tasted cat pee and cut grass, but I have tasted hay, having been raised on a horse ranch and possessing boundless curiosity about the way things smell and taste). 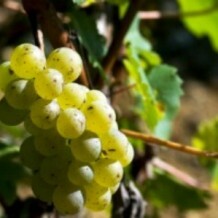 Sauvignon Blanc and Fumé Blanc are basically the same wine – both are made from Sauvignon Blanc grapes. I believe it was Robert Mondavi that first started calling it “Fumé Blanc,” because he found that it sold better under that moniker. I like to pair this aromatic white wine with sushi, salads and spicy Mexican Ceviche. It’s also great as an after work “welcome home” wine, served without food. This wine should come with a warning label, because it is simply too easy to drink! Aromas and flavors of ripe melon, lemon blossom, grapefruit and cut hay abound. The mouthfeel is crisp and juicy. In a word, yum! I’m tipping my glass to another delicious steal from Napa Station. Mouthwatering aromas of honeysuckle, orange blossom, pink grapefruit, alfalfa hay and a bit of Graves style minerality delight the nose and continue as flavors in the zippy zesty mouth. This is a delicious Sauvignon Blanc for only $12. Buy some. Buy some now! Hello, gorgeous! Aromas of orange blossom, jasmine and gardenia are complimented by ripe honeydew melon, savory green herbs and exotic spice notes. These aromas continue as flavors in the perfectly balanced, juicy mouthfeel. This wine was so aromatic that I wanted to splash some behind my ears! Alluring aromas and flavors of tropical fruit, melon, jalapeño (and, yes, cat pee) all play nicely together from the first sniff through the crisp mouth and on through the long, delicious finish.